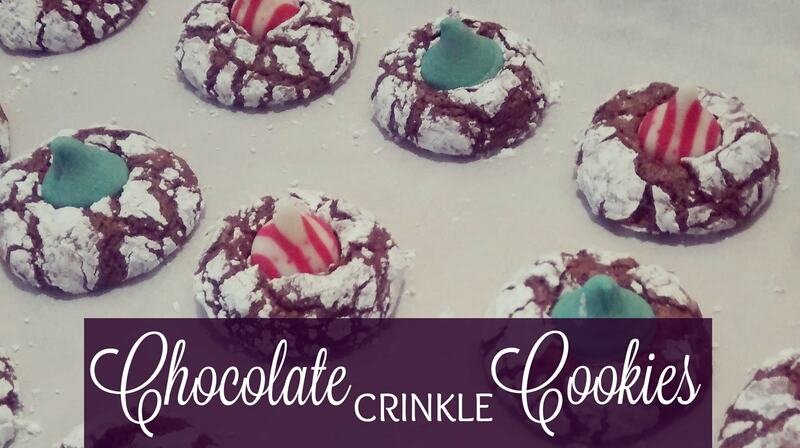 Chocolate Crinkle Cookies - THE OLIVE BLOGGER - Recipes your family will love! If you’re looking for a festive cookie, with a nice cakey texture, and delicious chocolate taste, this is the one for you! It is very simple to make, and makes a ton of tasty cookies for you to enjoy (and share if you like). I use peppermint kisses on mine to add the festive touch, but you can add any flavour chocolate you like, or omit all together and use festive sprinkles instead. The best part of baking is the ability to customize each cookie for your own family! Chocolate Peppermint Crinkle Cookies- a chewy chocolate cookie topped with peppermint kisses,a perfect festive cookie for your goodie trays! 1-2 packages of kisses 200g or your favourite chocolate! In a large bowl (or your stand mixer) whisk together sugar, oil, eggs and vanilla. Stir your flour mix into the wet ingredients until JUST COMBINED (you do not want to over mix this batter). Cover your mixture and chill for two hours. While your mix is chilling you can unwrap all those kisses and place them in a bowl in your freezer to get nice and hard (this prevents them from melting as soon as they touch the hot cookie later on). Preheat your oven to 350 degree Fahrenheit and line a cookie sheet with parchment paper. Prepare a small bowl with the icing sugar (this is only for rolling the cookie so it does not need to be full!). Scoop your dough into 1/2 tsp balls (it should be slightly larger than an acorn, about the size of a toonie). Roll the balls in the icing sugar and place on baking sheet. Bake 11-13 minutes (start to look cakey as you can see below) remove from oven immediately and place kiss in the center! Place in freezer right away until the kisses are no longer shiny (this allows them to keep their cute shape and colour). Thankfully for us it was freezing cold for our baking day so any of our items that required chilling went straight out to the patio table! Remember how I promised you some great gift ideas with my baking posts?! Well see below for a couple of my favourite items for the baker in your life 🙂 (Tomorrow will be something for the creative person on your list, stay tuned!) This post contains affiliate links, which cost you nothing more, but allow you to see what I use and love in my own kitchen! About to post now Krista!! Where are you located, maybe we are in different time zones :(! Hope you enjoy the Crunchy Peanut Butter Squares!! Oh that is so fantastic to hear Krista! I am glad you are enjoying them everyday! I have a sweet treat in the next couple of days that originated from Newfoundland 🙂 Let me check the settings to see if it is something on my end that doesn’t allow the photos as I would love to see them! Pingback: Chocolate Orange Shortbread Cookie - THE OLIVE BLOGGER - Recipes your family will love!